UPDATE on Skier Morgan and Gus:Taking the winter off in 2011 has come to an end. Morgan made it back to Stowe Vermont on Friday, March 18th. She started working off her massive pile of debt on Monday March 28th. In 75 days she hit up 35 different ski areas, from East to West. Mostly West. Check out the Trip Wrap Up Page, for the highlights and all the stats. Gussie is elated to be home. Check out updated skiing pages, with video! Like- Breck is here! Step back into 2008-2009 winter season. It all started with the 'Ski USA' deck of cards and a collection of skiers from Stowe sitting around a living room fire, beers in hand. The game was a modified version of kings. 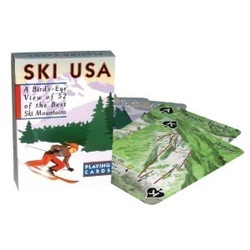 All the cards were upside down on the table, and the players would pick a card, read the resort named on the card out loud, and all players who had not been to that card's ski mountain would have to drink. I have done my share of skiing in the East, and some out West...But I did not end up sober at the end of the game. And that filled me with sadness. The next day, after I read the note I had written myself apparently after or sometime during the game (so I would not forget of course!) I resolved to broaden my horizon. My dog Gussie and I are going to depart from our point of origin in the east, and ski as much as we can, (hit up as many mountains as we can) until we reach the west coast and we have had our fill. Or I guess until we run out of money. We will be car camping, moteling, couch crashing and cooking canned beans on the car radiator. Whatever it takes. Whats this trip all about? skiis. She also burns me on the hill, and I don't want to look bad. 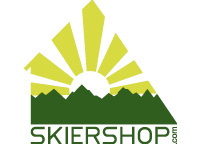 Picture by Skiershop's Mike Thomas. Worth the trip. 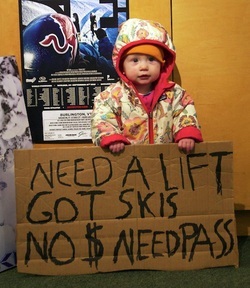 Check out 'Raise the Bar', The Skier's Community.